An “endorsement” is an addition to the standard policy. Endorsements often, but not always, cost more. The added coverage could mean the difference between a claim that’s covered and paying out of pocket. Here are a few endorsements that you might need to cover frequently overlooked scenarios. Other Members of Household – HO 04 58 This endorsement is important if you live with someone to whom you are not related or legally married and/or someone under the age of 21, such as a foster child or the child of the person to whom you’re not legally married. You might have considered these people guests, but guests don’t usually reside at a dwelling for more than a short, limited period of time. With this endorsement, the person(s) you name will be entitled to the benefits of your homeowners policy. You may not use this endorsement to name tenants or renters. These people should buy their own renter’s policy. Sometimes you have an interest in a home you don’t live in or own. You might have a financial interest in your son’s or daughter’s house, for example. This endorsement adds you as an “insured” to protect your interests as respects all aspects of the policy, both property and liability. 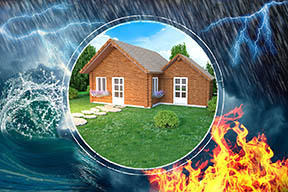 Typically, other structures on your property are covered for 10 percent of the amount of insurance on your house. Sometimes this isn’t enough, if you have a guest house, for example. Or you may have a number of other structures and the total value may be far more than 10%. Other structures may include garages, sheds, gazebos, patios, swing sets, barbeque pits, and so on. This endorsement will increase the limit beyond 10 percent of total policy limits. What if you have a “smart house” where one interface controls the lighting, security system, entertainment system, heating/air conditioning, home and garage entry and even temperature, water flow and exterior lighting? Or what about a powered stair, as for a disabled person? Or an electric vehicle charging station? If there is a loss to any of these devices or systems due to mechanical failure, rupture, bursting, implosion or explosion, etc., the regular homeowners policy will not cover them. It excludes “mechanical breakdown, latent defect, inherent vice or any quality in property that causes it to damage or destroy itself.” This endorsement eliminates that exclusion. You may obtain mechanical breakdown coverage for these items for limits of any multiple of $5,000, up to $50,000. Loss under this endorsement also triggers Coverage D – Loss of Use, so you’ll receive reimbursement for rental or living expenses if the home is uninhabitable during the loss. The policy deducible applies to any loss. The homeowners policy wording on this can be confusing, but essentially water back-up and sump discharge of overflow is not covered. That’s why you might want this endorsement. Coverage applies even if the overflow or discharge occurs due to mechanical breakdown or power failure. The endorsement also covers cleanup, but not the cost to repair damage to the pump. Not built or modified after manufacture to exceed a speed of 25 miles per hour on level ground. The basic policy has a sublimit of only $1,500 for theft of jewelry, watches, furs, precious and semi-precious stones. It also provides only $2,500 for theft of silver and gold items. This endorsement may be used to increase the special limits of liability provided under the homeowners forms for jewelry, watches and furs; money and securities; silverware, gold ware and pewter ware; guns and portable electronics. The increased limit of liability and the total limit of liability may be shown either on the endorsement or elsewhere for each class of property for which an insured wishes additional protection. The homeowners policy limits coverage to 10% of the value of the home for upgrades necessary to comply with local building codes if you need to rebuild. Sometimes a home is so out of date you will need more than 10% to comply with current building codes. This endorsement increases coverage for ordinance of law from 10% to whatever limit is entered in the schedule. To find out about adding any of these endorsements to your policy, please contact us. Get a CLUE, Don’t Buy a Lemon!